Yes my friends, it's another fake food holiday that I will shamelessly promote because I love making sundaes. I will also shameless plug episode 33 of the Nosh Show. In it, I rant about the terrible new Sunny D X and we dig in to one thirstifying happy happy fun time package. So, you all know I love pancakes right? And I love ice cream on pancakes even more. 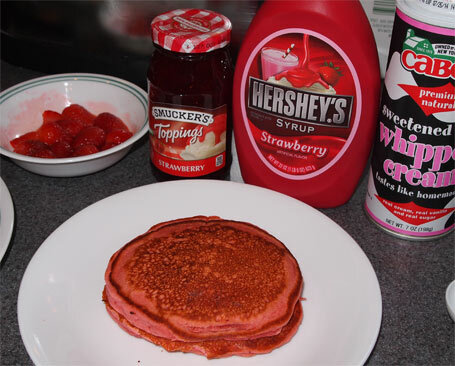 So, I had been waiting for the right Saturday to make some lovely, egg-free, dairy-free, fruit filled pancakes.... and when the batter didn't taste sweet enough, I dumped in a bunch of Hershey's Strawberry syrup that turned everything pink (note: convincing a little boy to try bright pink pancakes is harder then it sounds). My ultimate goal was to do a showdown between smucker's and hershey's, but this wasn't even a far fight. In no way should you ever use runny Hershey's strawberry syrup as a topping. I mean, you can, it's not that it tastes bad, but it's just too runny and goes everywhere. It's just not a pretty topping... .it's kind of gross looking actually. 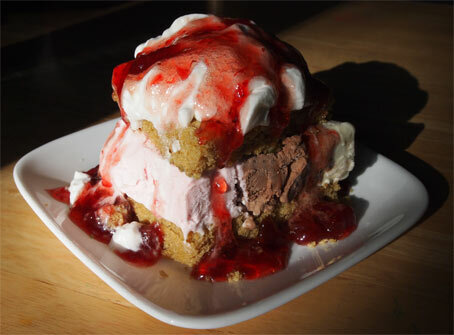 Isn't that way better with the Smucker's Strawberry Topping? 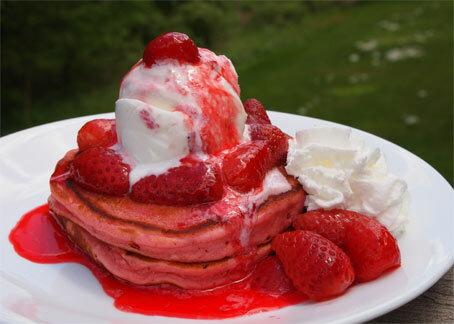 Ahhhh, you can practically taste the rich, sweet strawberry rush can't you? Good times, good good times. And there's your strawberry sundae day tip... of the day.... uggg. Please note that I have started using Hershey's Sundae Syrups and they are a lot of fun. So this post isn't to mock Hershey's, it's too mock my impatience with using the inappropriate topping. Have a good day everyone!